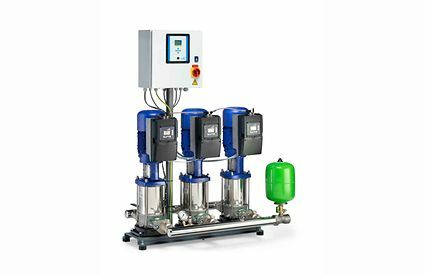 Yet another new product the KSB Group is presenting at the ISH trade fair 2019 are its pressure booster systems of the KSB Delta Primo type series with the design variants K, VP and SVP, each offering different features. The fully automatic systems are supplied ready-to-connect. They are equipped with either two or three Movitec high-efficiency centrifugal pumps. The maximum flow rate per system equals 67.5 m3/h, the highest head 134 metres. The Booster Control Advanced microprocessor control unit starts and stops the pumps using cascade control (variant K) or a frequency inverter for speed control (variants VP and SVP). With its field bus interface the system can also be operated from an external PC. On the control cabinet display, LEDs in easy-to-read traffic light colours indicate the operating status of the system. Should a duty pump fail, the control unit will immediately start up the next pump. For transmitting warnings or alerts to a higher-level control station two additional volt-free contacts on terminals are provided. The SVP variant is fitted with a high-efficiency IE5 synchronous reluctance motor of the KSB SuPremE type series and a PumpDrive Eco variable speed system. The more economical K and VP variants come with IE3 motors. All type series require a mains frequency of 50 Hz. The pump is started up by a pressure drop in the piping when a consumer installation is opened. When the pressure in the membrane-type accumulator rises, KSB Delta Primo stops. Should lack of water occur in the inlet, the microprocessor control unit will automatically stop the system to prevent any damage caused by dry running. The manufacturer assembles and tests all systems at the factory prior to sending them out, so all operators have their units delivered ready-to-connect. This makes commissioning easy and fast for the service personnel. Thanks to shut-off valves downstream and upstream of each pump, replacing a pump does not require the piping to be drained. To prevent contamination of its components KSB Delta Primo is manufactured and assembled under stringent hygienic conditions. All wetted parts are made of stainless steel or brass. The sealing elements are made of drinking water approved EPDM. This results in corrosion resistance and a long service life. Having the fluid handled flowing through the membrane-type accumulator prevents stagnation and microbial contamination inside the accumulator. The systems are approved for drinking water to the French ACS and British WRAS regulations, which are amongst the strictest in all of Europe. All installed valves are approved in accordance with the German DVGW drinking water regulation. What makes the newly designed lift check valve unique is that its length can be adjusted to enable easy removal of the pump for maintenance.